Home / Uncategorised / Upgrade to EndNote X9. Download. View basket “Upgrade to EndNote X9. Download.” has been added to your basket. Upgrade to EndNote X9. Download. You will need your serial number from X8 or X7 to activate your license. Once your order is completed, you will receive an order confirmation with instructions for downloading your software. Your EndNote product key will allow you to install EndNote on both Mac and Windows computers without having to purchase separate versions. Your order confirmation will contain the installers for both Mac and Windows. Your purchase of the EndNote desktop software also includes access to EndNote online with unlimited file storage, unlimited reference storage, and group sharing. Once you install your software, register at my.endnote.com. Tap into hundreds of online databases and instantly harvest what you find. EndNote automatically downloads and attaches free, online full-text PDFs to your saved references. Reference groups keep things manageable and reveal overlaps or intersections in your research. Organize, rename, annotate, search and open your PDFs directly within EndNote. Access all your research from anywhere, including your comments and annotations. Create bibliographies and citations right within Microsoft® Word using Cite While You Write. Take your pick of 5,000+ formats – including popular styles such as APA, MLA, ALA, Harvard and Chicago style. Use EndNote tools to deliver a perfectly formatted paper, manuscript, CV, grant application or other research-rich document. Invite colleagues and team members into your EndNote library – including notes and annotations. With unlimited storage, you can share as much as you want with up to 14 users. Connect with the ideas, thinkers and practical tips that can take your work to a new level. Collaborate privately with your own team, or openly with the wider research community. With EndNote, you’re better connected with extra research solutions that help you showcase your work, uncover relevant sources more quickly and get your research ready for publication. We’d love to build more bridges – ask about our API. Create an online profile to associate you with your scholarly work, assuring an accurate record of output and attribution. This forms a gateway for colleagues to quickly locate your published work and to identify you as a potential collaborator. Take it a step further and link your ResearcherID profile with your EndNote community profile. Now you can share information and ideas within EndNote online. By design, you can navigate easily between EndNote and Web of Science while collecting research. When you sync your EndNote library, your Web of Science references will automatically display their Times Cited Count and a link to Related Records (Web of Science subscription required). Related Records uses the citation linking magic in Web of Science to find references that share citations with yours, spotting the truly relevant research much faster than a typical topic or author search. Used by some of the most prestigious commercial publishers, societies, associations, and university presses in the world, ScholarOne Manuscripts helps publishers and authors simplify the manuscript submission process. A manuscript written with EndNote templates and Cite While You Write is optimized for submission through ScholarOne. Build plug-ins that add new functionality. Script or batch existing capabilities and features. Create tools that extend the GUI. Provide better integration with third-party tools and products. Directly access records and data in EndNote Libraries (databases). Directly import or export into or out of EndNote. Leverage the power of the EndNote formatting engine (formatter). The Software Development Kit is intended for technical developers who know object-oriented programming languages, particularly C and C++. Users should also be familiar with the tools needed to produce compiled application code or DLLs. The API is available for both the Macintosh and Windows operating systems and behaves identically on each, unless otherwise specified. Individual customers and third-party partners are encouraged to use the EndNote API to develop tools that closely interact with EndNote. Any party developing a component or tool that uses the EndNote API for commercial or wide-spread use must also sign a license agreement with Thomson Reuters to legally employ the API, Software Development Kit and any associated tools, documentation, or code. EndNote X9 for Students. Download. Same powerful package, amazing low price. If you’re buying EndNote for the first time, this is the choice for you. 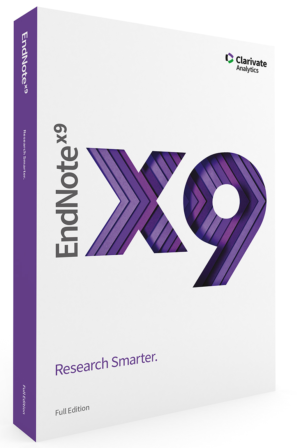 EndNote X9 for Students. Download. EndNote X9. Download.